I've said it time and time again - the BEST way to keep your children entertained during car journeys or flights is a combination of sticker books, good quality and engaging toys and your trusty iPad. Of course I would prefer if any screen time was educational too and I am always on the look out for new ways I can tear my children away from watching endless youtube videos from their hero Stampy Longnose! 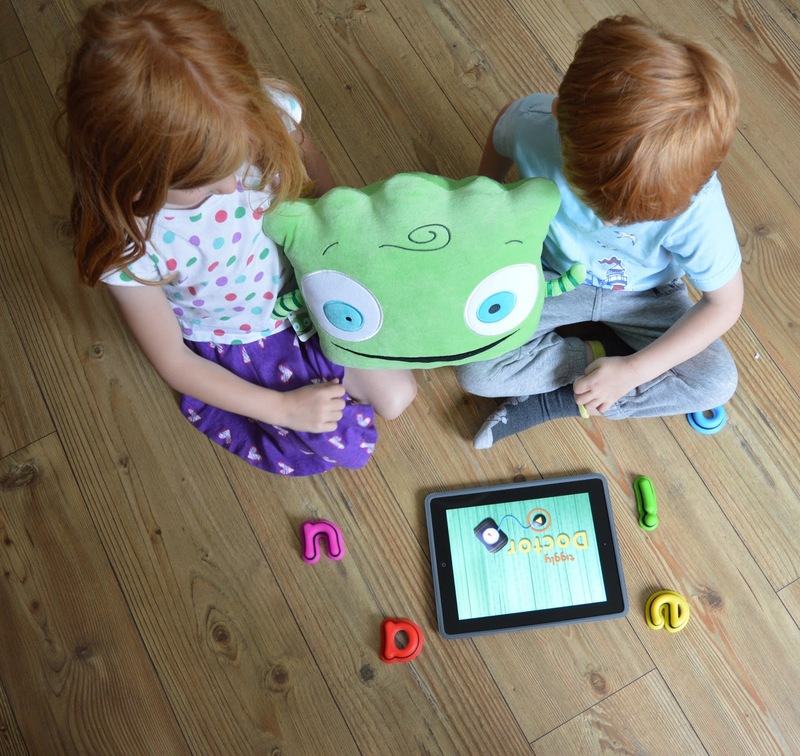 Tiggly Toys are designed to work with iPads and selected tablets and encourage kids to develop their fine motor skills, language, math and creative skills. The toys are ergonomically designed with silicone touch points which are designed to act just like your fingertips when using a tablet. 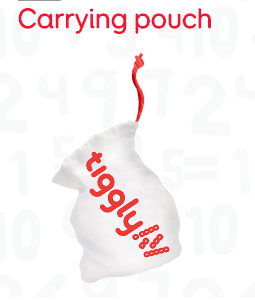 Tiggly Maths is designed for ages 3-7 years which after testing it out with my three children I would say is spot on. Your box will contain 5 interactive math counting toys, 3 award winning (and super fun) apps and a carry pouch. Click here for a list of compatible devices. Tiggly Maths was lots of fun for both Heidi (aged 6) and Jack (aged 4) who actually played nicely for once and worked together to solve the simple addition puzzles. There are three games included which are fun, engaging and a little silly at times. We loved Tiggly Chef Addition which involved creating some crazy recipes, recognising numbers and counting the correct number of ingredients. Heidi and Jack created a lovely dish for me featuring salami, strawberries and lime - erm yum! I was particularly impressed with the ADDventure numberline game which encouraged Heidi to remember her number bonds and quickly work out missing numbers to move her loveable character across the screen and via various obstacles. Check out this short video from Tiggly which will give you more of an insight into just how fun and creative the maths games are. Tiggly Words is aimed at children aged 4-8 years, I think I would probably pitch it at ages 4-7 to be honest as it was a little 'babyish' for my computer-mad 8 year old (his words not mine). In your Tiggly Words box you will receive 5 interactive vowel toys, 3 award winning apps and a carry pouch. Tiggly Doctor Vowels was a huge hit with Heidi and Jack who spent most of their time playing this game giggling and laughing and some of the patients and their crazy problems. They were having so much fun that I must admit I felt like a smug parent knowing they were learning too. Submarine Spelling is probably Jack's (aged 4) favourite game, it is lovely to see him starting to spell and form words at this age using the game. He was screaming with delight and a shark appeared and chased him across the screen. Tiggly Toys were so much better than I expected. We loved how you receive 3 free downloadable games as well as your toys in every box. The games are fun and silly for kids, encouraging them go back for more and really work at developing their skills. They come with their own travel bag which makes them an ideal toy to pack up and take on a long journey with you. Above all, I like how the toys and apps have been specifically designed to make your children think, learn and create. You can purchase Tiggly Maths and Tiggly Words from Amazon and they will be launching on QVC this week. They are priced at £24.99 each which I must admit, before I saw the toys for myself I did think this was a little on the pricey side. However my mind has been changed after watching the hours of fun our children have had playing with the apps and I like how it has kept them engaged and interested in learning during the first week of the holidays. 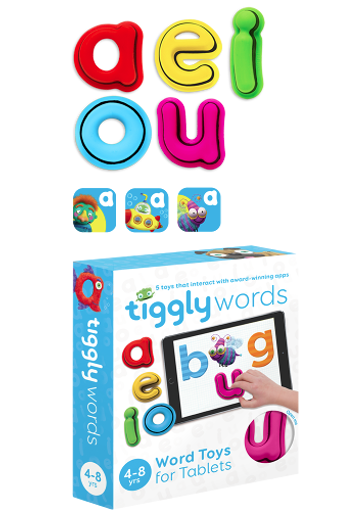 We are very excited to be giving away a Tiggly Words set worth £24.99 to one lucky reader. Simply enter via the rafflecopter giveaway below. Good luck! This looks really great!! I think my two and a half year old would totally love it! These sound great, and a much better use of screen time! I think my grandson would totally love it! My two little girls would love this! Me too! I would win it for my friends young twins! My little 5 year old - Matthew! These look absolutely fab we would love these for our car trips or flights. Off to enter now. My little one would absolutely love this. For my 4 year old son. I would like to win this prize for my nephews. My daughter is struggling with school so this would be ideal. My grandson who would love it! My two boys, they would love it! all my children would love it. My daughter is nearly 3, so I think I'd put it away for Christmas. my little boy - he'd love it! I'd love to win it for my daughter Millie! My Grandson who will be starting school in September. My grandson will be four in September so this would make an ideal present for him. My 5 year old son Ronan would love this...he loves to learn!